Armor Top urethane protective coating is formulated for high-traffic areas to protect against chemicals and wear. 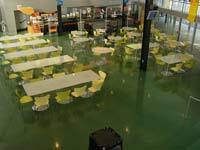 Whether in a school or industrial facility application, it meets flooring needs by saving significant time and money on cleaning and maintenance. It resists abrasion and chemicals, produces little odor and complies with all volatile organic compounds regulations.